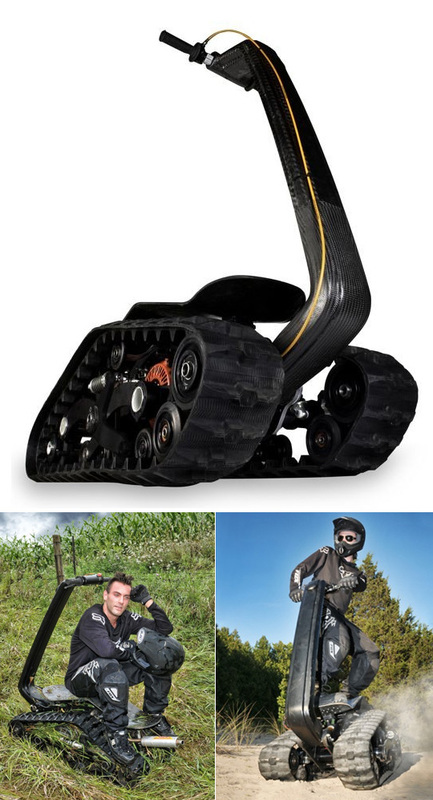 1) the tracks look very similar to the ATV aftermarket products available. The rubber track and plastic sprockets is a popular choice, and in addition, some suspension is built in to provide impact absorption and terrain following. 2) The video and picture seem to show two different motor configurations. The first is a 14 HP Honda 4 stroke air cooled engine common to a variety of lawn and garden equipment. This can be seen as the red cowling in the top image. The second appears to be a small 2 stroke 125cc engine from a motorcycle as evidenced by the small muffler shown on the bottom left image. The video implies, and my intuition suggests, that the torque of the 4 stroke engine is the essential ingredient in this package and likely performs better than the small 2 stroke engine. However, the additional weight of the 4 stroke as compared to the 2 stroke likely has a negative impact on the handling of the vehicle. Interesting to find out their experience and what decisions are made for the production models. 3) The video shows how agile the DTV is and how smoothly it corners. The controls appear to be based on weight transfer on the foot platform used modulate the left and right track speeds via a torque converter or similar mechanism. The upright handle appears to be for maintaining rider stability and operating the throttle. The riding position makes me think of a stand-up jet ski with tracks. Check out the video of the DTV in action below.